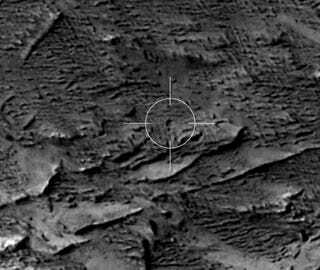 We have such a vigilant orbital watch program that when a meteor a few meters in diameter pinged Mars, we spotted the crater within 24 hours. We're living in the future, people. Unless this is the past, because NASA announced the discovery in Latin. Project scientist Bruce Cantor spotted a crater 50 meters in diameter that showed up in Mars Weathercam photos from March 28th, but wasn't in the photos from the previous day. This is the largest crater in the solar system with confirmed before/after photo pairs, making it all the more astonishing that we can pin down the time of creation to such a short timespan of 24 hours. Now you see it, now you don't! A fresh crater arrives between photographs on March 27 and March 28, 2014. Of course this meant we had to check higher-resolution photographs, where not only can we see the new crater, but a scatter of smaller ones nearby. A 50 meter crater is relatively small — just the size of an Olympic swimming pool — so would have been created by an impactor only a few meters in diameter. While the Martian atmosphere is thin, it's still enough to break off little bits and pieces to pelt the surrounding area. A scattering of smaller craters are possibly from smaller pieces breaking off the main rock. Looking around nearby, the Mars Orbiter also photographed new dark regions. These are being interpreted as landslides triggered by ground-shaking from the impact. With images a day apart, it's impossible to identify if it was one massive landslide, or several smaller piecemeal events that eroded the slope. The HiRISE Twitter account announced the discovery in the formalist format possible on the always-informal platform: a picture-poster annotated in Latin. Nicely done, social media team, I had no idea that's how you conjugated ... any of that. I also have no idea what's going on and what possessed them to make a poster-announcement in a dead language, but I think I love it. It's almost playful-smugness, escalating "rocket scientist" to "Latin-conjugating rocket scientist." Update: Nick R. points out that HiRISE has an entire Latin-only Twitter account and a Tumblr. It looks like they take their "All the languages!!" volunteer translation project very, very seriously. HiRISE is awesome. This adds on to the awesomeness that was Curiosity first spotting asteroids from an alien world. Dear Mars: You're amazing, and I'm so glad we're obsessed with watching you, even if our constant surveillance is borderline creepy. All images extracted from the NASA/JPL video. Tip via the Bad Astronomer. HiRISE regularly brings us amazing images of dynamic, mysterious landscapes.